Born in Venice, Italy in 1885, Leonardo Dudreville came of age in an era of profound cultural transformation. 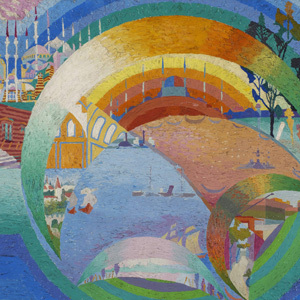 In 1910 he settled in the industrial city of Milan, where he associated with a group of radical poets and painters who called themselves The Futurists. They revered machines, automobiles, and locomotives as potent symbols of modern life, making them the subjects of their experimental art. Interested in both mechanical and natural forces, Dudreville joined with like-minded artists and architects to form their own vanguard group called New Tendencies (Nuove Tendenze), which held its debut exhibition in 1914. Traversing the Po Valley in the Snow was painted in the winter of 1914, just months after the outbreak of World War I. 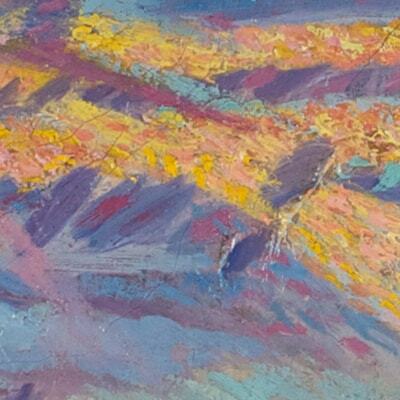 Although not readily apparent, the subject of this dynamic painting is a locomotive speeding through the northern Italian landscape. 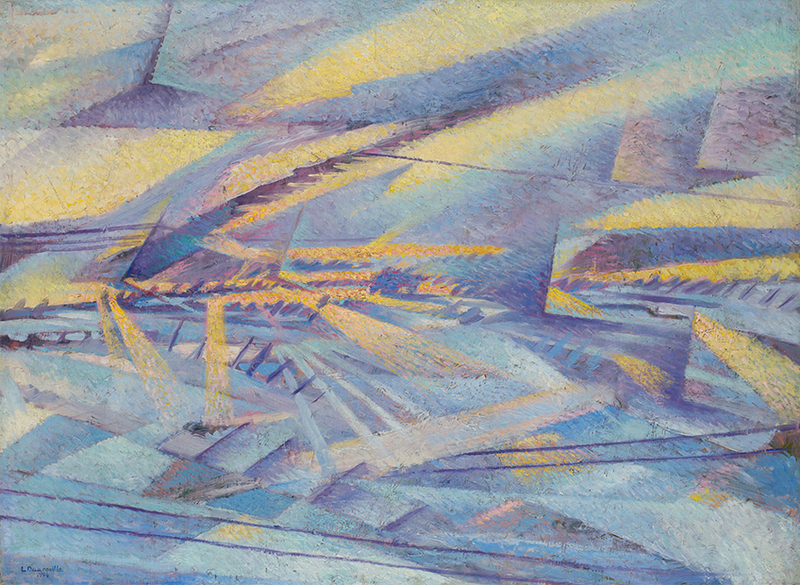 Rather than depict it in a traditional manner, Dudreville used criss-crossing lines, shard-like shapes, and contrasting colors to suggest the velocity and force of a train shattering the peaceful countryside. This turbulent scene may well convey some of his own anxiety over the looming international crisis. 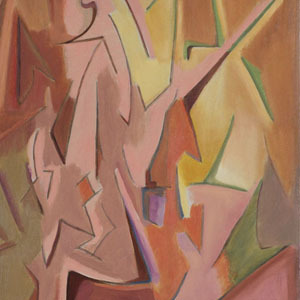 Revolutionary paintings such as this established Dudreville as a pioneer of abstract art in the early twentieth century. (I am determined) to abolish any representation of the photographic appearance of objects, instead determining the emotion, to reach, at all costs, its expressive essence, synthesizing these features into the multiple powers of form, color, depth, etc. . . 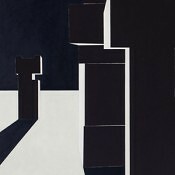 This I call ABSTRACTION, not to be confused with fantasy, which, in this case, would become the equivalent of arbitrariness.